the church celebrated its Golden Jubilee in 2008 after the church building had undergone restoration. Father Souhait played a large part in the design of the church building, modelling it on the pilgrimage church in Lourdes, France. Kota Raja Mahadi – This historic fort was actually an arch of the fort. 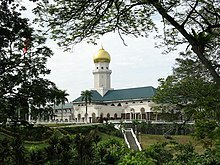 In the old days, there was a struggle between Raja Mahadi and Raja Abdullah for the control of the Klang district. Tugu Keris (Keris Monument) – A memorial erected to commemorate the Silver Jubilee of the Sultan of Selangor's installation in 1985. The monument is specially designed to depict the Keris Semenanjung that symbolises power, strength and unity. Tanjung Harapan (The Esplanade) – Fronting the Straits of Malacca, the Esplanade is a sea-side family recreation spot near to Northport that houses several seafood restaurants. Nice setup for sunset-gazing and also for anglers to fish. 小印度– Colourful street from the striking saris hanging from shops to the snacks and sweetmeats on sale from shops and roadside stalls. During Deepavali, the Indian festival of lights, the street is astoundingly transformed into a colourful spectacle of lights and booming sound of music. Sri Sundararaja Perumal Temple – Built in 1896, it is one of the oldest and the largest of the Vaishnavite temples in Malaysia. The temple is often referred to as the "Thirupathi of South East Asia" after its famous namesake in India. Sri Subramania Swamy Temple,Klang – A Hindu temple devoted to the worship of Lord Murugan in Teluk Pulai,Klang that was established on 14 February 1914. It holds a unique distinction among the Hindu temples in Klang as it was founded and managed by the Ceylonese/Sri Lankan community who lived around the vicinity of the temple. Prayer rituals are done like those in Sri Lanka and certain festivals specific to the Ceylonese/Jaffnese community are celebrated here. The arasamaram or sacred fig tree which is in the temple was there since 1914 and is possibly one of the oldest living tree in Klang. Connaught Bridge is one of the oldest bridge in Malaysia's Klang Valley region. It was built in 1948 by the British. The bridge is located in Jalan Dato' Mohd Sidin (Federal route ) near Connaught Bridge Power Station in Klang Selangor. At one time, Connaught bridge can only be crossed one vehicle at a time. No lorry could pass it because it was limited to car, van and small vehicle only. While on the bridge, you will heard the sound of wood 'cracking'! The wooden bridge closed in 1993–1994. In 1995 the wooden bridge was replaced by a concrete box girder bridge. Jambatan Kota is the first double-decked bridge in Malaysia and is located in Klang, Selangor. The bottom deck is a pedestrian walkway bridge while the top deck is a motorist bridge. The bridge was closed to car traffic in the '90s due to high demand that necessitated the construction of a new bridge. The new Jambatan Kota is located beside of the old bridge. The old bridge was constructed between 1957 and 1960, and was officially opened in 1961 by the late Sultan of Selangor, Almarhum Sultan Salahuddin Abdul Aziz Shah as part of the celebration of his coronation as the ninth Sultan of Selangor. ^ Turning Klang into a clean town. 马来西亚星报. [24 November 2015]. ^ 中國報70週年特輯（巴生）‧環繞巴生走一回. 中國報. 2016年10月5日 [2016年12月22日]. （原始内容存档于2016年12月22日） （中文（繁體）‎）.